This story is remarkable in that its cast is exclusively custom made. 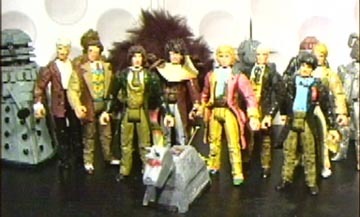 It features all the Doctor Who figures that had been made at that time. If all the characters look somewhat similar in their poses, there's a very good reason; the base figures all came from the same source. Basically the female is a 'Return of the Jedi' Princess Leia (Jabba's Prisoner) while the male is a 'Phantom Menace' Chancellor Valorum with the arms of 'Return of the Jedi's Han Solo (Endor). Molds were then made of these figures so as many could be produced as neccessary, cheaply creating an army of 'clones' that could become any character by the simple addition of details using miliput and super sculpy. The only figures that differ from this method (in this story) are Mr Sin, a modified 'Phantom Menace' Anakin Skywalker and the Giant Robot a modified 5" tall soldier from a Pound Shop. The Daleks were carefully constructed out of card and paper while the Mechanoids were created in photoshop, printed on to card and then put together. Alpha Centuari is made of clay with a cloth cape. The arms are hinged using cocktail sticks and the head is separate with a cocktail stick neck. Arcturus is made of card. His head and the pipes on his life support are made of sculpey. The story was first shown in three episodes between November 2003 and January 2004. This is the original cover. The TV show's fortieth anniversary was coming up. When the classic show was on the air, it had been something of a tradition that on the Anniversary of each decade there was a multi- Doctor story. The 10th Anniversary had seen The Three Doctors. For the first time, all the existing Doctors got together and fought the renegade Time Lord Omega. At 20 years, the Doctors were brought together again for the Game of Rassilon in The Five Doctors. For the 30th Anniversary, the show had already been long since cancelled and despite the proposed 'Dark Dimension' multi Doctor story, we got The Dimensions In Time- a Children In Need non-cannon romp that reunited the 3rd to 7th Doctors. Kind of. But for the 40th Anniversary, there was to be no big get together. The closest we were to get was the Big Finish audio Zagreus starring 8th Doctor Paul McGann also featuring Colin Baker, Sylvester McCoy and Peter Davison (plus a host of companion actors) but not as their TV characters. The novels and DMW comic strip steered clear of multi-Doctor stories so it was up to the AFT to deliver. It would have been called The 8 Doctors but that title was already taken by the BBC novel. 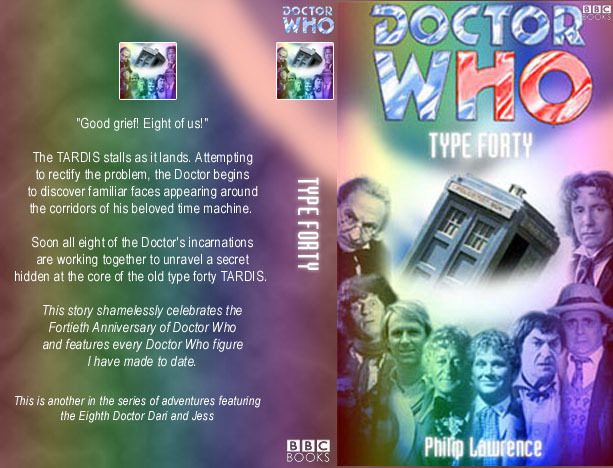 "Type Forty" is the class of the Doctor's TARDIS and also very neatly refers to the Anniversary. The actions of the 4th Doctor in the final episode is inspired by early drafts of The Five Doctors in which it was implied that the 4th Doctor was acting contrary to his other selves and was even suspected as the villain. Since the story was set (almost) entirely in the TARDIS, several variations of the classic roundel wall had to be devised partly to make the story look more interesting and partly to differentiate between the different TARDIS locations. Among the different walls are (obviously) the classic white with yellow roundels, a grey/ black stone version, a wood panelled wall, a nautical version where the roundels are portholes. There is even a 'London Underground' station with station signs bearing the word 'TARDIS'. The TARDIS data bank is inspired by the memory vaults shown in DWM comic strip Changes where the TARDIS keeps records of the places it's visited. The data bank resembles an art gallery with the monsters stepping from the paintings. All 8 TV Doctors united for the first time. The engine room was a bit of a copout. It was intended to be a massive steam engine but due to time and the effort involved this idea was never realised. The second idea was to make it like clockwork. The result is a background of vague cogs. The planet's surface is made of scrunched up paper and most of it was done in photoshop. The debris is a piece of Phantom Menace Pod Racer that came with Teemto Pagalies. There are also some photoshopped roundel walls among the wreckage. 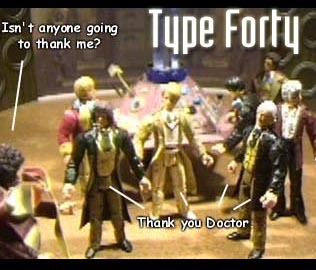 An early idea for Type Forty saw the newly debuted Richard E Grant Doctor step in at the last minute to save the day, but it was decided that this was a story for past Doctors, not new ones. At the time, this story came at the end of a series of 8th Doctor adventures which introduced his travelling companions, the half clone Dari and twenty-first century actress Jess. Since this is very much a retrospective adventure they are removed from the action from the outset. The TARDIS War is entirely my own invention but does tie neatly into established continuity that the Doctor's TARDIS was in for repairs when he erm... took it.